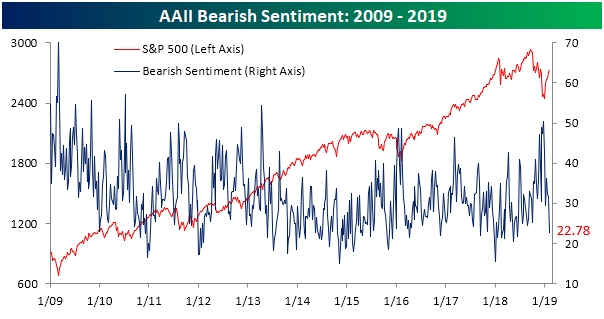 AAII released its weekly survey of individual investors today with a sizeable uptick in bullish sentiment. Last week, bulls and bears were dead even at 31.8%, but this week the bullish camp rose to 39.87%. A portion of this boost in optimism likely came from the more dovish and clear tone of the FOMC from their meeting last Wednesday. This week’s reading is now the highest level since the first week of November. 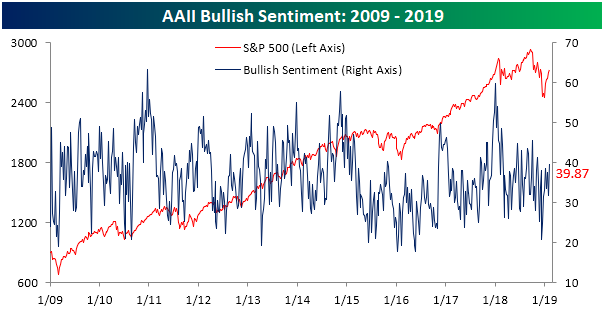 Additionally, another sentiment reading we like to look at is the Investors Intelligence survey of newsletter writers which was released yesterday and was similar to the results of the AAII survey with bullish sentiment rising to its highest level since the final week in October. Bearish sentiment, on the other hand, fell dramatically this week, dropping to 22.78% and is now at its lowest level since May 17, 2018. This reading has brought bearish sentiment out of the range it had been stuck in for the past few weeks around the lower 30’s and also back below its historical average of 31%, which despite the post-Christmas rally, it has been above for the past few weeks. 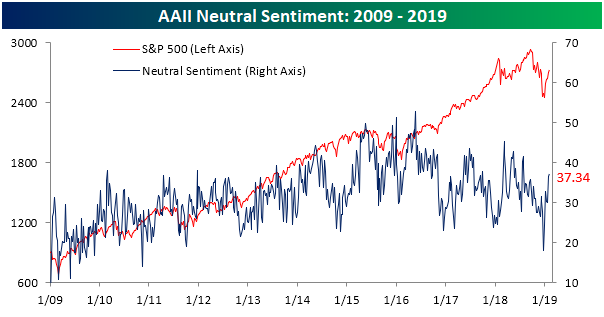 Neutral sentiment has continued to pick up off of its multi-year low at the end of December. This week, investors reporting neutral sentiment rose to 37.34% from 36.49%. That is the fourth straight week of increases in this sentiment measure.